I think I was just kicked out of the New Citizen's Institute. 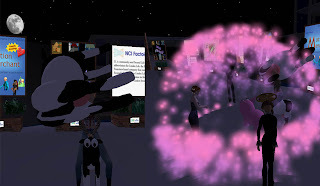 I met a bunch of fiesty English gals (or so I suspect) and we began a show and tell, in front of the educational panels posted for newbies, that involved a dancing cow and a pig that sent out jets of pink particles. I wore my steampunk crash helmet and my mate wore a cow on her head. We jumped into a motorized rescue boat with a few Heineken's and next thing I knew I was informed that the sim were in was shutting down...might have been the giant schooner that we rezzed onto the lecture hall. Oops.